Visiting a beautiful region like Sabang Regency is definitely worthy. Why is that? Tourists can find many stunning places to visit including waterfalls! One of them is located in Sukakarya Sub-District called Pria Laot. To be exact, it resides in Batee Shoek Village and has become a recommended place to relax and conduct photography. Another interesting fact is that the waterfall is located in the upstream of Sarung Keris Mountain. That means visitors can feel the fresh atmosphere and enjoy the pristine nuance once they get to the location! As mentioned before, Pria Laot Waterfall resides near to a majestic mountain. No wonder, the nuance feels so peaceful and refreshing due to the presence of unspoiled nature and green lush trees on the site. Not to mention the songs of birds and wild animals may accompany tourists during the visit! In terms of appearance, the waterfall looks beautiful indeed and it features a small pond as well. The size of the pond is about 10 meters per square and it has the depth of around 1.5 meters. Have no worries. It is safe to get in the pond and take a bath in it! What can people do in Pria Laot Waterfall? That is the question. According to the locals, most visitors would enjoy photography on the site. Thanks to the beautiful landscape and unique atmosphere. Even the water looks stunning regardless of the weather. Aside from photography, tourists may enjoy trekking as well. That means they can explore the site and satisfy their hobby. This adventure is suitable for everyone due to the easy landscape, actually. What is next? It seems that visitors won’t miss the opportunity to learn more information regarding the waterfall as well. In this case, they need to ask a local guide or villagers beforehand. It is said the water comes from Aneuk Laot Lake and Sarung Keris Mountain. Before reaching the waterfall, it flows through Pria Laot River though. No wonder, the locals gave the name to the site based on such fact. Another thing to do in Pria Laot Waterfall is to get in the pond and take a bath in it! Here is the unique thing. The pond features small fishes called Garra Rufa. These fish may eat the dead skins of the feet and make them healthier and cleaner! This explains why the waterfall is famous for its natural fish therapy as well. In fact, tourists do not need to pay anything to enjoy such therapy! 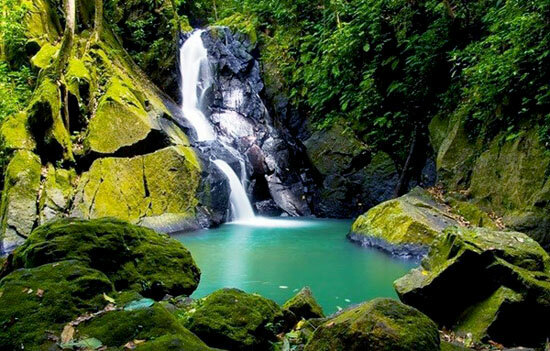 Tourists can take advantage of a rented car or motorcycle to get to Pria Laot Waterfall. From Sabang City, it takes only 15 minutes as the distance is 8.3 km. For a faster trip, they need to take Cut Nyak Dien Street though. The good thing is that the site provides a parking area, so visitors can simply park their vehicle there.